On June 20, 2012, astronomers working new with observational data from NASA's Lunar Reconnaissance Orbiter (LRO) spacecraft announced that water ice may make up as much as 22 percent of the surface material in Shackleton Crater at the Moon's South Pole. The spacecraft used a laser to illuminate the crater's interior and measure its albedo (natural reflectance), revealing that Schackleton is brighter than other Lunar craters, which is consistent with the presence of ice. As the crater is two miles deep and more than 12 miles wide, the small tilt of the Lunar spin axis keeps the crater's interior permanently dark and therefore extremely cold, which would allow ice to persist (NASA news release and Science News). made of water ice (more). The third planet from the Sun, Earth, is the fifth largest with a diameter of 12,756 kilometers (7,928 miles). This rocky planet is the only one in the Solar System that is covered with liquid water (some 70 percent of the surface). It also has an unusually large satellite for its size, as Earth's Moon has about a quarter of its diameter (but only 1.23 percent of its mass). 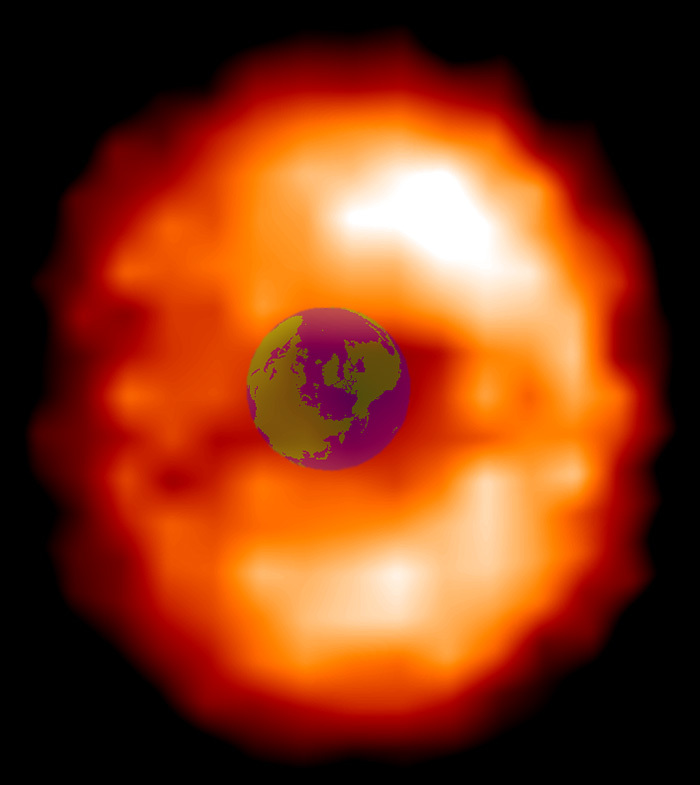 Many astronomers now believe that the Earth was formed from the collision of a Mars-sized protoplanet ("Theia") with the primordial Earth. 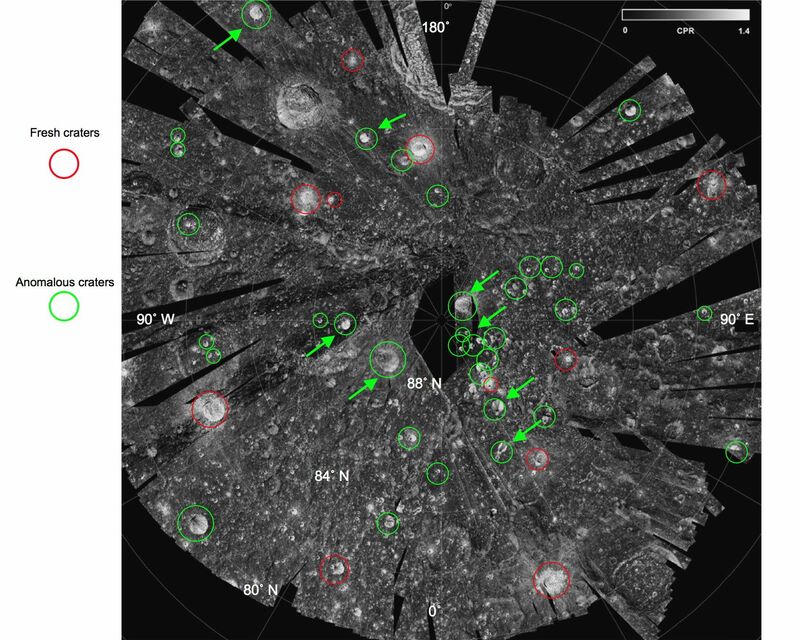 Much of the protoplanet's core merged with the Earth's own, while the lighter materials of the collision reformed as the Moon (more discussion, illustrations, and links and 2007 update). The collision probably produced many Trojan moons at the Earth-Moon triangular Lagrange points L4 and L5, which may have persisted for up to a 100 million to more than a billion years for smaller bodies (a few tens of kilometers or miles across) looking like very bright stars similar to Venus and Jupiter in Earth's night sky (Ker Than, New Scientist, May 6, 2008; Lissauer and Chambers, 2008; and separate modelling work by Matija Cuk). 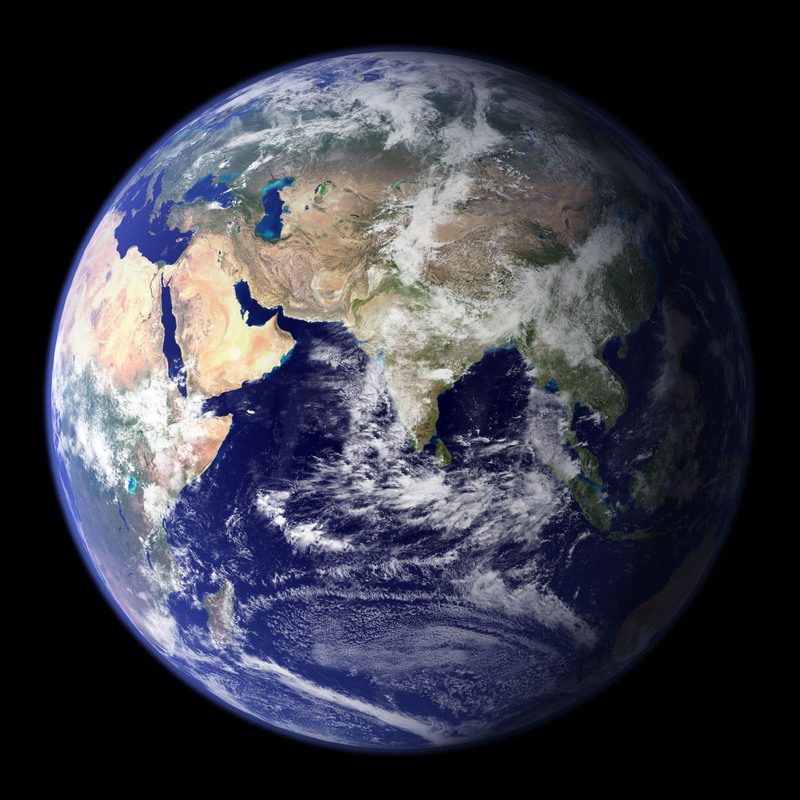 In addition, the gravitational interaction of the Earth with its Moon through tidal movements has been slowing the Earth's rotation by about two milliseconds per century, so that about 900 million years ago, Earth's "year" was comprised of 481 "days" that lasted only 18 hours long. While the constant tidal tug-of-war between the Moon and Earth's oceans initially made the Moon's orbit more circular, it also led the Moon to recede further from Earth with the loss of gravitational energy so that it may have moved into long episodes of resonance with Jupiter and then Venus which subsequently made its orbit around the Earth much more "eccentric" -- elongating into an ellipse (Larry O'Hanlon, Discovery News, October 12, 2007; and Matija Cuk, 2007). Due in part to its mass, Earth is the densest major planetary body in the Solar System. 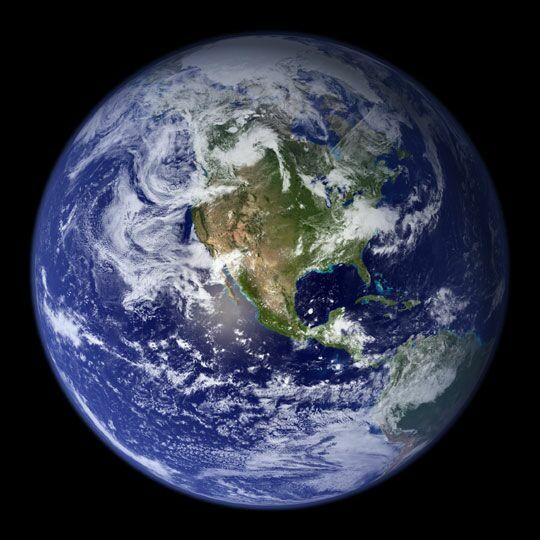 Based on its metal content but excluding the effects of gravitational compression, Earth would be only the second densest major planetary body in the Solar System after Mercury, as Earth's uncompressed density of 4.4 gm/cm3 is only about 83 percent of Mercury's 5.3 gm/cm3 (Murchie et al, Scientific American, March 2011). Accounting for the gravitational compression of its much greater mass on its core, however, Earth is denser than Mercury, with 1.02 times Mercury's "mean" or compressed density (5.52 versus 5.43 gm/cm3, see NASA Planetary Factsheet). 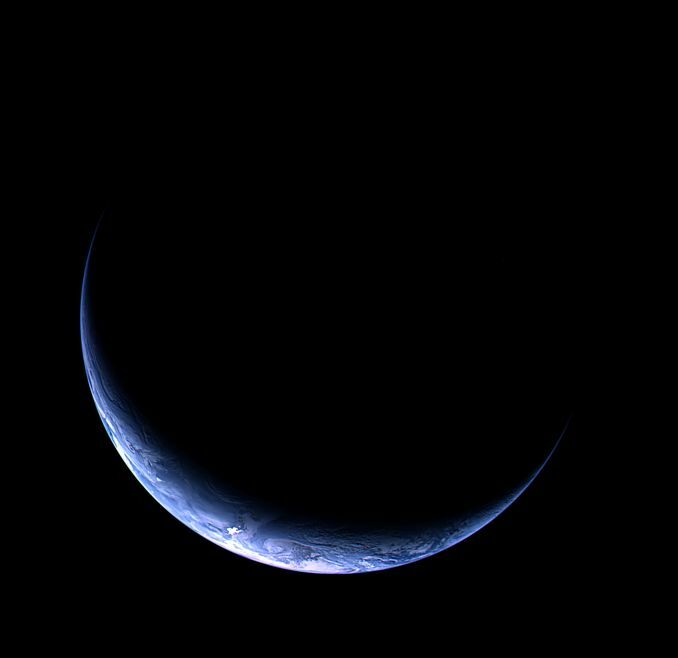 Viewed from space, Earth's classic image is that of a bluish ball with shifting white clouds, the result of an atmosphere actively sustained by its widespread life. Its atmosphere helps to shield its surface from meteors, most of which burn up before they can strike the surface but also contributed to the early atmosphere during a heavy bombardment around 4.5 billion years ago (Holland et al, 2009; and Shanta Barley, New Scientist, December 14, 2009). The atmosphere is composed of mostly nitrogen (78 percent) and oxygen (21 percent), with traces of argon, carbon dioxide, and water. The presence of free oxygen is quite unusual because oxygen is a very reactive gas. Without the constant and massive respiration of plants and phytosynthetic microbes worldwide, oxygen would quickly combine with other elements, and there would be little free oxygen, as has happened on Venus and Mars. 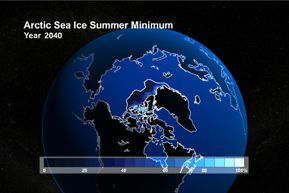 The rising level of carbon dioxide and other greenhouse gases in Earth's atmosphere is leading to higher surface temperatures and melting ice deposits, such as the loss of Arctic sea ice during its warm summer months after 2040 according to simulation runs of the Community Climate System Model in 2006 (more information and animation). 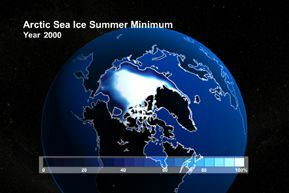 On April 7, 2011, scientists announced at the European Geosciences Union's general assembly that modelling of updated data on the thinness of Arctic ice and warm water currents indicate that complete melting may occur as early as 2016 (more). The primordial Earth probably had much more carbon dioxide, but virtually all of it has been incorporated into carbonate rocks, dissolved into the oceans, or incorporated into living plants. However, the tiny amount of carbon dioxide still in the atmosphere at any time warms the Earth's average surface temperature by about 35 �C (95 �F) above what it would otherwise be (from a frigid -21 �C/-17 �F to a comfortable 15 �C/59 �F) via the "greenhouse effect." Without this improved retention of solar heat, the oceans would freeze. On the other hand, the activities of Earth's dominant lifeform (Homo sapiens sapiens) have been increasing the level of carbon dioxide in Earth's atmosphere which appears to be promoting a rising trend in global temperatures, melting ice deposits, and rising sea levels (more from the IPCC). 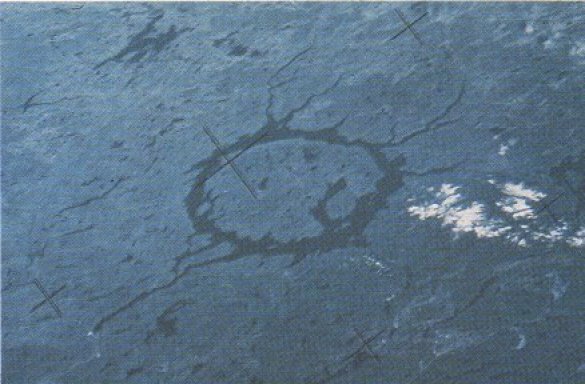 Although smaller than the Chicxulub impact structure that may have contributed to the demise of the Dinosaurs, Manicouagan, a 214-million-year-old crater in eastern Canada (Quebec) that has been eroded nearly flat by glaciers, is easily seen from space because of its huge 62-mile (100-km) diameter. It was made by the largest known fragment of an object that also created: the 25-mile (40-km) diameter, Saint Martin crater in western Canada (Manitoba); the 15-mile (25-km) Rochechouart crater in the Massif Central of France; the 9.3 mile (15-km) Obolon' impact structure in the Ukraine; the 5.6-mile (9-km) Red Wing crater in the western U.S.; and possibly also the 7.4 mile (12-km) Wells Creek, Tennessee impact structure and the 2-mile (3-km) Newporte, North Dakota crater -- both in the U.S.
Earth is currently the only planet on which water can exist in liquid form on the surface, and most (71 percent) of the planet's surface is indeed covered with water. The heat-absorbing capacity of Earth's oceans is crucial to keeping the planet's temperature relatively stable. 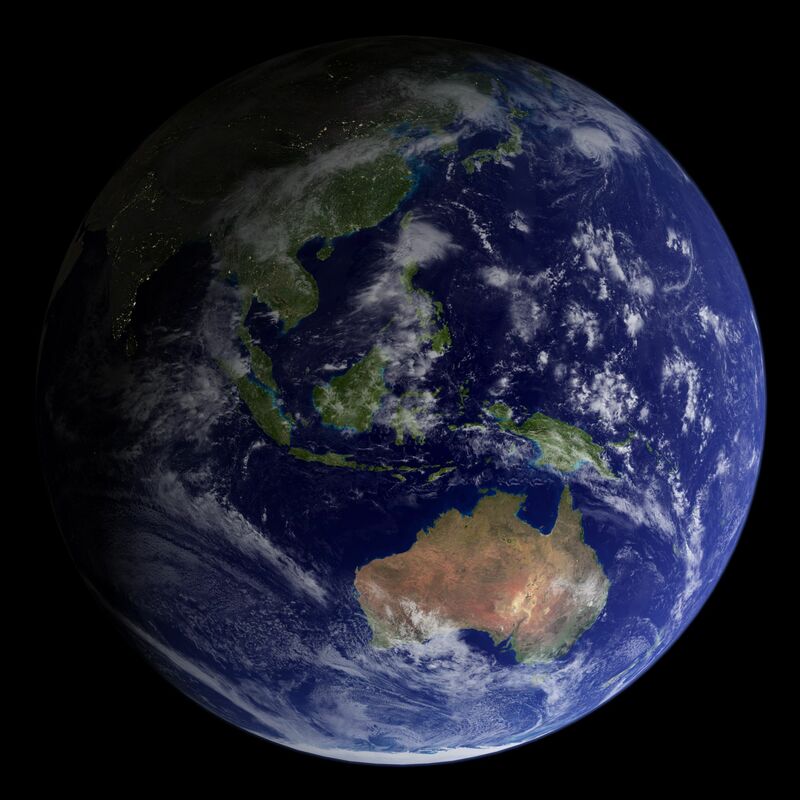 Liquid water is also responsible for most of the erosion and weathering of the Earth's continents, a process that is unique in the Solar System today and has quickly eroded evidence of even large meteorite impacts, although it may have occurred on Mars in the distant past). 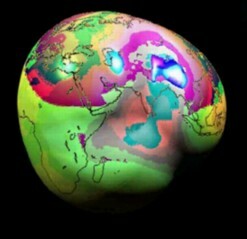 Most of Earth's surface is very young and active. Within an astronomically short period (500 million years or so), erosion and tectonic processes destroy and recreate most of its surface, and so evidence of earlier geologic history including even large impact craters is quickly erased. Thus, while the Earth is about 4.56 billion years old, the oldest known rocks are about four billion years old, and rocks older than 3 billion years are rare. The oldest fossils of living organisms are less than 3.9 billion years old, and no record of the critical period when life was first getting started has yet been detected and recognized. Unlike the other three terrestrial planets, Earth's crust is divided into eight large and 20 small, solid "plates" which float around independently on top of the semi-fluid mantle below. 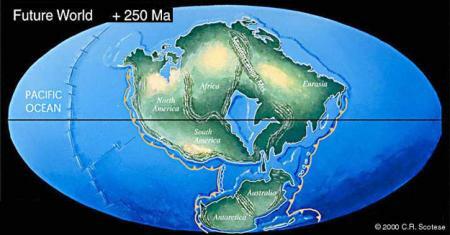 Under the modern the theory of plate tectonics, some plates move away from each other and new crust is created by upwelling magma from below in a process called "spreading." Other plates are being destroyed through the process of "subduction," where plates collide and the edge of one dives beneath the other to be melted in the hot mantle below. other processes such as water -- or ice -- flows may shift masses faster (more). Once in a while, a truly massive plume of hot rock from the Earth's mantle can erupt through the crust for centuries or even millenia, producing acid rains, destruction of the ozone layer from emissions of chlorine-bearing compounds, and a chill down in climate from the resulting increase in atmospheric dust and sulphur-based aerosols. 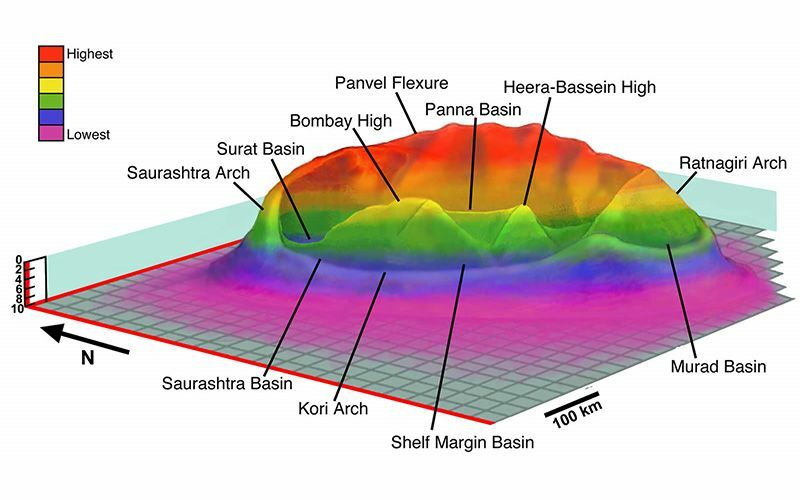 The last such eruption occurred some 65 million years ago (press release, Basu et al, 1993), created India's Deccan Traps, and -- in combination with the Chicxulub meteorite impact -- contributed to the extinction of the dinosaurs. An earlier and even larger event in Siberia in combination with an impact by a meteorite that may have been slightly larger than the one associated with the Dinosaur extinction event -- that is, 3.7 to 7.4 miles wide (six to 12 km) and equivalent to a magnitude-12 earthquake -- may have caused the Permian-Triassic extinction 251 million years ago, when 90 to 95 percent of all species were wiped out. The researchers (U.R. and U.W. 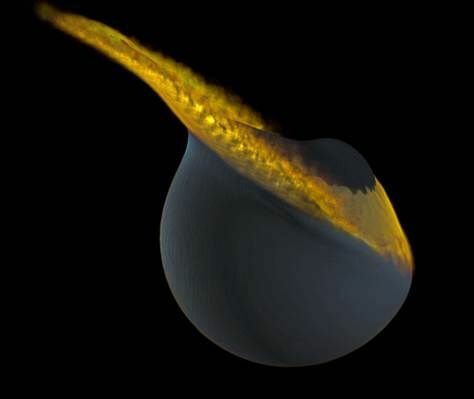 press releases) suggest that perhaps in both extinctions, a plume of lava may have already risen close to the surface, but a massive meteorite impact turned a small eruption into a colossal one. As a result, within less than a million years, enough lava oozed out of the ground in Siberia to cover the entire planet 10 feet (three meters) deep. (One Permian-Triassic crater candidate is the 125-mile/200-km or more diameter Bedout Structure off the coast of northwestern Australia. For more discussion of geologic evidence, see: Asteroid and Comet Impact Craters and Mass Extinctions; and Luann Becker, Scientific American, March 2002.) In 2002, physicist Richard Muller suggested that large asteroidal or cometary impacts could trigger unusually widespread "avalanches" of lighter minerals (such as sulfur and silicate that drift up to to collect at inverted mounds at the outer core/mantle boundary) and cause large plumes of magma to rise to the surface (Richard Muller, 2002; in pdf). blindness, skin cancers, and death. Arenas, a city in southern Chile. By mass, the Earth is composed of mostly iron (35 percent), oxygen (30 percent), silicon (15 percent), and magnesium (13 percent). It is made of distinct layers: a thin crust, upper mantle, lower mantle, outer core, and inner core, as well as transition zones. 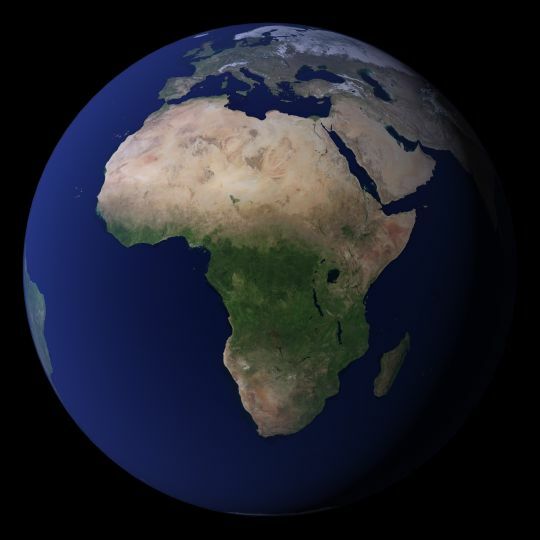 The crust is thinner under the oceans but thicker under the continents. While the inner core and crust are solid, the outer core and mantle layers are semi-fluid. fractions of a percent from place to place. 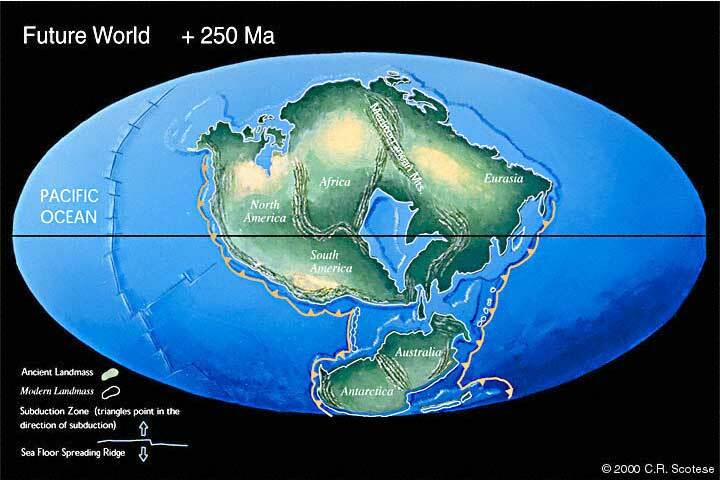 Most of the mass of the Earth is in the mantle, which is mostly made of the minerals olivine and pyroxene (iron and magnesium silicates). The elements calcium and aluminum are abundant in the upper mantle and while silicon, magnesium, and oxygen are major components of the lower mantle. The core is probably composed mostly of iron (perhaps with some nickel), where the temperature may be as high as 7227 �C (13,040 �F) at the center -- which is hotter than the surface of the Sun (See further discussion of the Earth's interior structure ). Discovered in the 1930s, the inner core appears to be a solid sphere of mostly iron and nickel. 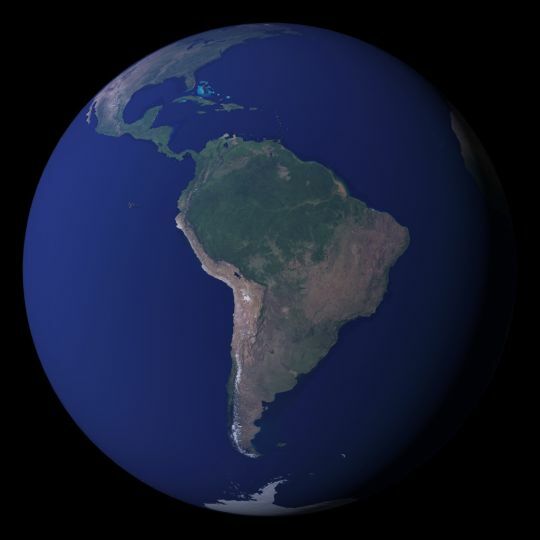 In 2002, its diameter was finally measured to be about 1,520 miles (2,440 km) across based on shock wave data generated by earthquakes from more than 300,000 seismic events between 1964 and 1994. In a phenomenon called anisotropy, those shock waves were found to travel faster moving from north to south than from east to west, probably because the inner core formed in crystalline manner, where the iron and nickel atoms are line up in the same direction and so change the speed at which the waves pass through depending on their initial direction. The shockwaves reveal that the inner core appears to harbor an "inner inner" core that may be about 370 miles (600 km) in diameter. 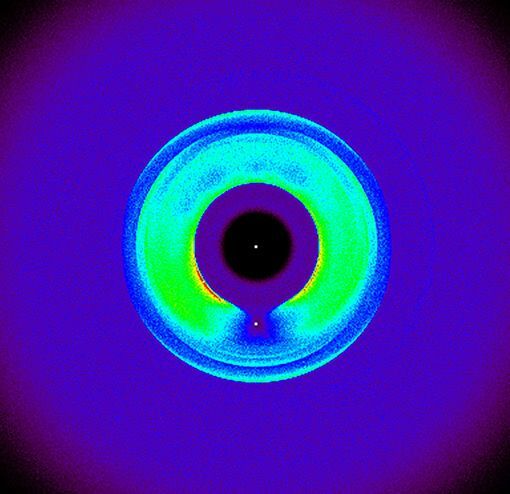 The anisotropy effect was much stronger in this region, which suggests that its composition is even more crystalline composition with a different angle of most resistance (arising from different crystalline alignment) from the rest of the inner core. The scientists analyzing the anisotropy believe that this difference may be the result of changes in the environment of the core during its formation. 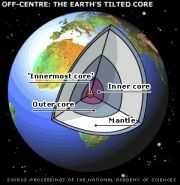 Professor Guy Masters of the Scripps Institute of Oceanography believes that the "core within a core" could be left over from an early stage of the planet's formation. 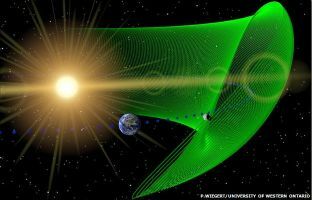 to form its magnetosphere, deflecting the Wind from a head-on collision with its atmosphere. 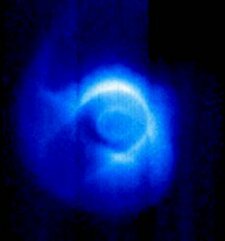 Earth has a modest magnetic field produced by electric currents generated in its metallic core by its rapid spin, which is distorted into a tear-drop shape by the solar wind. 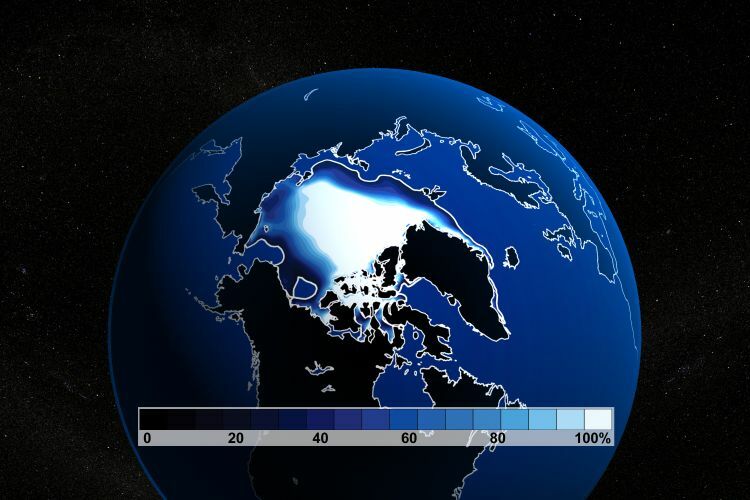 Along with the atmosphere, the magnetic field shields life on Earth's surface from most harmful cosmic as well as Solar radiation, which can be seen in the northern and southern hemispheres as aurora (i.e., "Northern Lights" towards the Arctic). 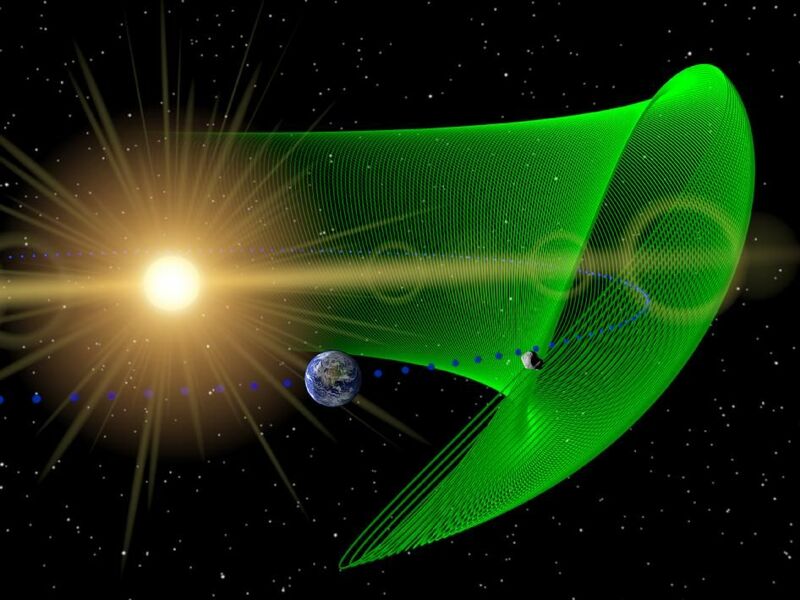 This field traps radiation in a pair of doughnut-shaped rings of ionized gas (plasma) in orbit around the Earth called the Van Allen radiation belts. 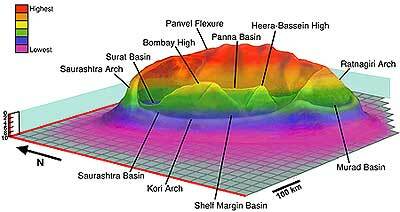 The outer belt stretches from 19,000 to 41,000 km (11,800 to 25,500 miles) in altitude, while the inner belt lies between 7,600 to 13,000 km (4,700 to 8,100 miles) in altitude. According to the geological record, Earth's magnetic field dwindles down to nothing for about a hundred years every few hundred thousand years. Then, it gradually reappears but with the north and south poles flipped. 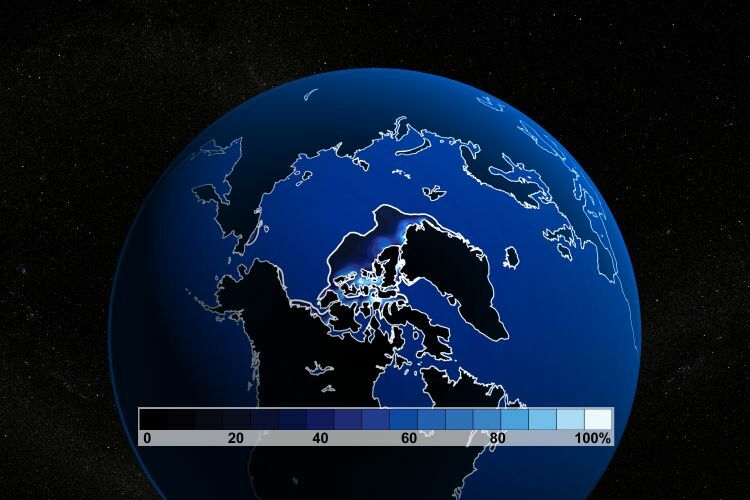 The last reversal of the poles occurred about 780,000 years ago, and the strength of the magnetic field has diminished by about five percent over the past century. Hence, the Earth may be overdue for this cyclical event. 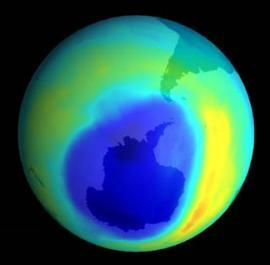 Given the anticipated loss of the magnetic field's shielding against the Sun's energetic subatiomic radiation and more ultraviolet radiation from the consequent erosion of the ozone layer, however, a magnetic reversal may cause serious ecological disruption to all surface lifeforms on Earth as well as threaten human well-being. Giant impactors may have helped to create the massive volcanic eruptions and lava flows known as the Deccan Traps at the end of the Cretaceous around the Dinosaur extinction event and the earlier and even more massive Siberian Traps around the even larger Permian-Triassic extinction event (Matt Kaplan, New Scientist, June 9, 2010; TTU press release). On July 9, 2010, scientists working with NASA's infrared Spitzer Space Telescope announced that the spacecraft had passed a cloud of dust created by the Earth as a "dust trail." This occurs because the inner Solar System around the planets and Edgeworth-Kuiper Belt is dusty from the passage of comets and collisions between asteroids as well as icier bodies beyond the Main Asteroid Belt. When the Earth moves through this dust disk, a tail forms beind the planet, because the Earth "creates a sort of shell or depression that dust particles fall into" and so thickens the dust in its rear, the tail, which the planet pulls along with its gravity around the Sun to form "a large dusty ring," according to Spitzer project scientist Mike Werner. By studying the Earth's dust tail, some astronomers hope to detect planets orbiting distant stars that may have similar dust tails (NASA Science News; and Spitzer new release). 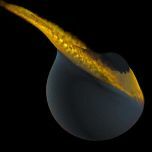 may also trail planets around distant stars (more). On March 11, 2011, NASA released a new image of the Moon's farside, created from over 15,000 images acquired between November 2009 and February 2011 by the Lunar Reconnaissance Orbiter. Unlike the Moon's nearside, which has widespread maria from ancient lava flows, basaltic volcanism on the rugged farside was limited to relatively few and much smaller regions, and so the farside is dominated by rugged highlands crust. Past investigations indicate that the farside crust is thicker than the nearside, which would have made it more difficult for Lunar magmas to erupt through the surface to create farside basaltic maria. The question of why the farside crust is thicker, however, is still a topic of recent and ongoing studies and may include tidal forces from Earth's gravity during the early formation of the crust -- as discussed at the bottom of the page (NASA / LRO news feature; and Seil Collins, New Scientist, March 17, 2011). 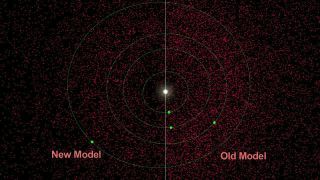 On August 3, 2011, two astronomers published an article on their theory that Earth once had two moons, both formed from debris crated from its collision with a Mars-sized protoplanet. The much smaller satellite (some 750-miles or 1,200 kilometers wide) eventually fell into the larger moon in a low-speed, "slow-motion" collision that should have taken several hours to complete. With around four percent of the Moon's mass and roughly one third of its diameter, the smaller satellite was probably parked at in a gravitationally stable Lagrange or "Trojan" point in the Earth�Moon system, with possibly even smaller Trojan objects. 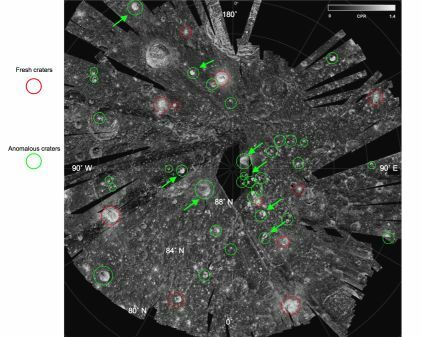 The remnants of the other satellite can be found on the crust of the Moon's farside, which has a thicker crust of highlands than its visible nearside of mostly low-lying lava plains that is richer in potassium (K), rare-earth elements (REE), and phosphorus (P) -- KREEP; models of crust formation indicate that KREEP elements would have been concentrated in the last remnants of subsurface magma to crystallize as the Moon cooled. 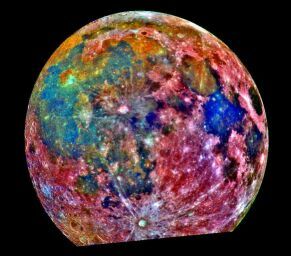 According to the astronomers, the most likely scenario is that some collision "squished" the late-solidifying KREEP layer to one side of the Moon after the rest of the crust had solidified, without globally melting the entire Moon to create the asymmetry now observed. Rescheduled due to high wind delays, NASA hopes to launch its Gravity Recovery and Interior Laboratory (GRAIL) mission with two spacecraft on September 9, 2011, in part to find supporting evidence for this double moon collision and Lunar highlands creation hypothesis (NASA science news; UC Santa Cruz news release; Tim Stephens, UCSC News, August 3, 2011; Jutzi and Asphaug, 2011; Lissauer and Chambers, 2008; Richard Lovett, Nature News, August 3, 2011; Nancy Atkinson, Universe Today, August 3, 2011; Matt McGrath, BBC News, August 3, 2011; Charles Q. Choi, MSNBC, August 3, 2011; David Shiga, New Scientist, August 3, 2011; and Ker Than, New Scientist, May 6, 2008). Larger and jumbo illustrations (more snapshots). a low-speed, slow-motion collision (more). The Moon was heavily bombarded early in its history, which thoroughly mixed, melted, buried, or obliterated much its original crust. The thinning and cracking of the crust allowed molten basalt from the interior to reach the surface and form its large dark lava plains ("maria"). The bombardment of large impacts ended about 3.5 billion years ago, and most lunar volcanism end about two billion years ago. Because the Moon does not have a significant atmosphere or surface water, the lunar surface has not weathered chemically as it would have on Earth. 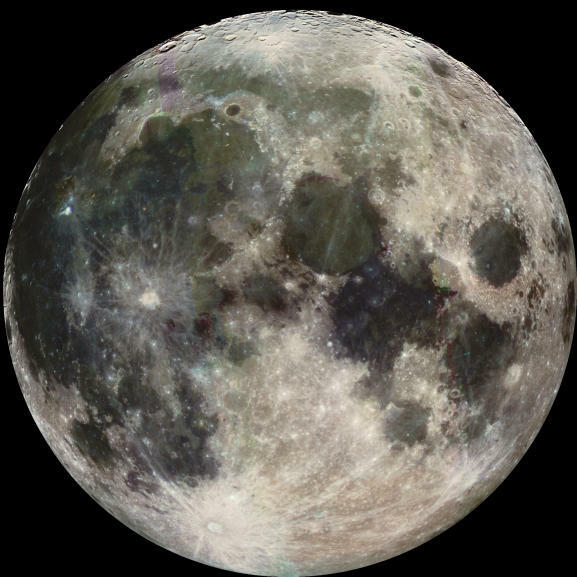 While there are still occasional large impacts, the Moon was considered to be geologically dead until evidence of outgassing (rapid releases of gas that blow off surface deposits and expose less weathered materials) within the past 10 million years was announced on November 9, 2006 (more). The Moon's surface has roughly the same land area as the continent of Africa. It is comprised primarily of the heavily cratered and very old uplands ("highlands") and the relatively smooth and younger maria. 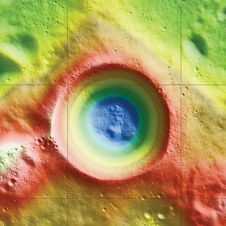 The maria (which comprise about 16 percent of the Moon's surface) are huge impact craters that were later flooded by molten lava. Most of the surface is covered with regolith, a mixture of fine dust and rocky debris produced by eons of meteorite impacts. The Moon's crust averages 68 km (42 miles) thick and varies from a thin layer under Mare Crisium to 107 km (66.5 miles) north of the crater Korolev on the lunar far side. 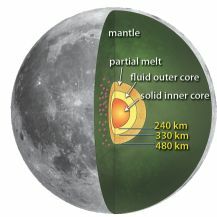 Below the crust is a mantle and possibly a small core of about 340 km (210 miles) in radius with two percent of the Moon's mass. 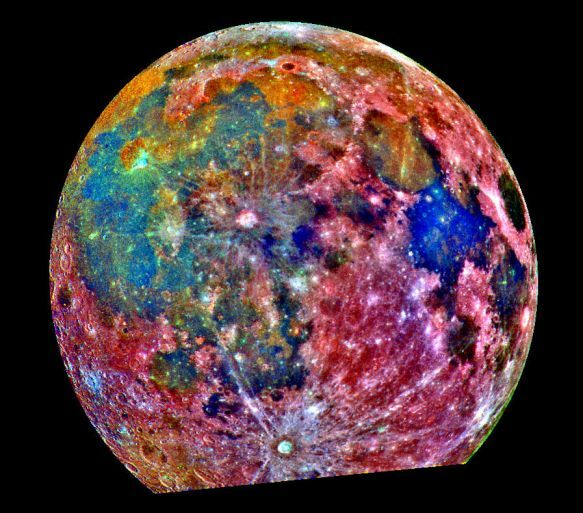 Unlike the Earth's mantle, however, the Moon's is only partially molten. Hence, the Moon has no global magnetic field, but some of its surface rocks still exhibit residual magnetism, indicating that there may have been a global magnetic field early in the Moon's history. With no significant atmosphere and no magnetic field, the Moon's surface is exposed directly to the Solar wind and cosmic rays like Mercury. Larger and jumbo false-color images. (more from Astronomy Picture of the Day and NASA). On January 6, 2011, planetary scientists using state-of-the-art seismological techniques to analyze Apollo-era data published a paper indicating that the Moon has a core similar to Earth's. 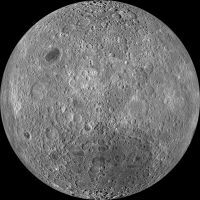 The moon appears to have a solid, iron-rich inner core with a diameter of nearly 300 miles (480 kilometers) across and a fluid outer core with a diameter of roughly 410 miles (660 km) wide. In addition, there seems to be a partially molten boundary layer around the core, with an estimated diameter of nearly 600 miles, or 970 km, across (NASA/MSFC news release; NASA feature; Richard A. Kerr, Science NOW, January 6, 2011; Weber et al, 2011; and Weber et al, 2010). 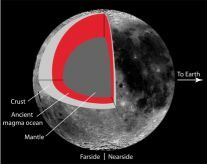 Tidal forces from the Earth's gravity when the Moon was still molten may have thickened its crust at the equator and produced to Farside highlands that are 3.7 miles (six kilometers) than the nearside. The farside's crustal thickness and its rugged topography may have been caused by spatial differences in tidal heating when the Moon's ancient crust was floating above the mantle on a liquid ocean of magma. 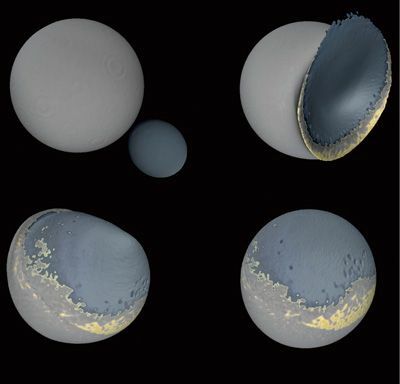 Such tidal effects may also be present on Jupiter's moon Europa and Saturn's Moon Titan (Garrick-Bethell et al, 2010; and Larry O'Hanlon, Discovery News, November 11, 2010). On October 21, 2010, scientists announced that new data uncovered by NASA's Lunar CRater Observation and Sensing Satellite (LCROSS) and Lunar Reconnaissance Orbiter (LRO) revealed more water than originally estimated on the Moon, around 5.6 percent of Lunar regolith at the South Polar impact site. The scientists also determined that around a fifth (20 percent) of the impact plume of Lunar soil in the shadowy impact crater was rich in other volatiles, including methane, ammonia, hydrogen gas, carbon dioxide, carbon monoxide, and even hydrocarbons and sulfur compounds. These volatiles may be remnants of a comet impact and also provide evidence for a water cycle involving water ice reacting with lunar soil grains, where water was found in some areas on the Lunar surface as relatively pure ice crystals. In addition, the Moon appears to be chemically active, and relatively large amounts of light metals such as sodium, mercury, calcium, magnesium, and possibly even silver were also found (NASA Science News; Jonathan Amos, BBC News, October 22, 2010; Schultz et al, 2010; Colaprete et al, 2010; Gladstone et al, 2010; Hayne et al, 2010; and Page et al, 2010). On November 13, 2009, NASA's Lunar CRater Observation and Sensing Satellite (LCROSS) mission announced that earlier detections of water had been confirmed in the Moon's south polar region. This conclusion was extrapolated from near-infrared spectroscopic analysis of the "high-angle" vapor plume and more lateral "ejecta curtain" created by the impact of the upper stage of the LCROSS' Centaur rocket into Cabeus crater. The 60-mile (100-kilometer) wide crater is located roughly 60 miles (100 km) from the Lunar South Pole (more discussion available from NASA press release, Science@NASA, and Astronomy Picture of the Day). Based on spectral signs of other volatiles containing carbon and hydrogen (probably including methane, ethanol, ammonia, and carbon dioxide) discussed at a mid-November 2009 meeting of the Lunar Exploration Analysis Group, much of the water may have come from cometary impacts (Dana Machkenzie, New Scientist, November 20, 2009). On June 20, 2012, astronomers working new with observational data from NASA's Lunar Reconnaissance Orbiter (LRO) spacecraft announced that may make up as much as 22 percent of the surface material in Shackleton Crater at the Moon's South Pole. 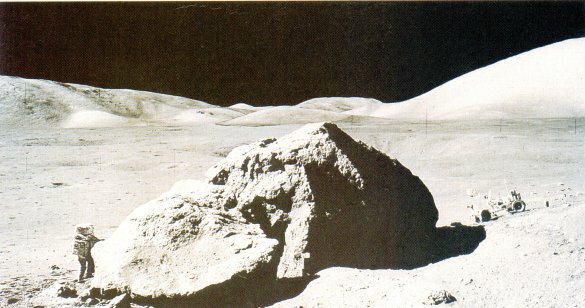 The spacecraft used a laser to illuminate the crater's interior and measure its albedo (natural reflectance), revealing that Schackleton is brighter than other Lunar craters, which is consistent with the presence of ice. As the crater is two miles deep and more than 12 miles wide, the small tilt of the Lunar spin axis keeps the crater's interior permanently dark and therefore extremely cold, which would allow ice to persist (NASA news release and Science News). 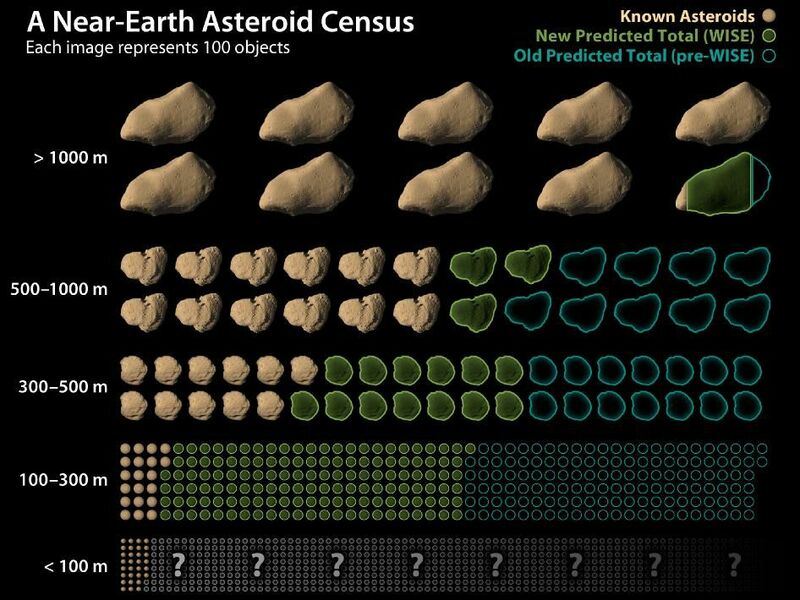 On July 28, 2011, astronomers reported the discovery of Earth's first known Trojan asteriod using NASA's Wide Infrared Survey Explorer (WISE) telescope. Designated 2010 TK7, the object orbits our Sun, Sol, in Earth's leading Lagrange point at L4, confirmation of which required additional observations on the Canada-France-Hawaii Telescope. Tracing a complex path that takes the object far above and below Earth's orbit, 2010 TK7 is about 50 million miles (80 million kilometers) from Earth but should come no closer than about 15 million miles (24 million km). 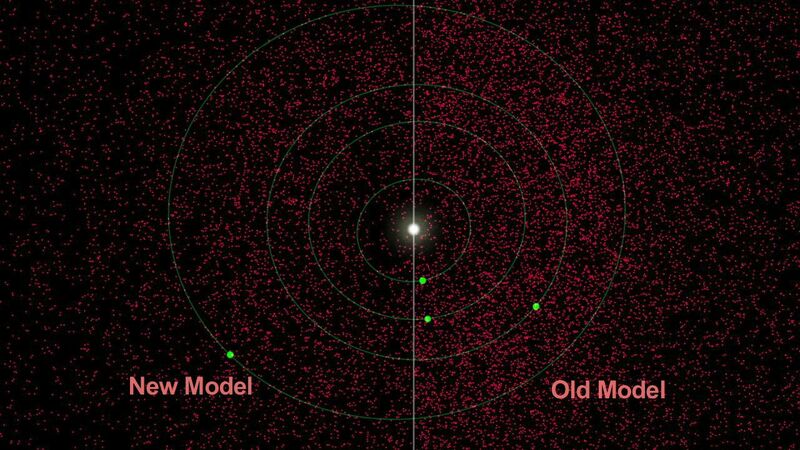 Located in the so-called Lagrange points that are 60 degrees ahead of or behind planets in their orbits around the Sun, Trojan asteroids have also been found in orbits shared by Mars, Jupiter, and Neptune (NASA WISE news release; Jonathan Amos, BBC News, July 28, 2011; and Conners et al, Nature, July 28, 2011). Larger and jumbo illustrations video). 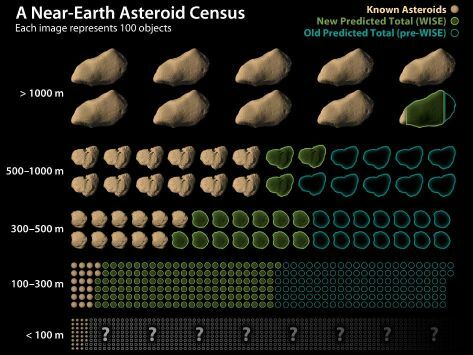 On September 29, 2011, astronomers working with new observational data from NASA's Wide-field Infrared Survey Explorer (WISE) announced there are fewer asteroids in Earth's vicinity than previously estimated. 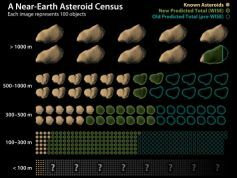 They calculated that some 93 percent of the largest near-Earth asteroids (bigger than 3,300 feet or 1,000 meters) have already been found, and, while most smaller asteroids remain to be found, they also estimated that there are 40 percent fewer mid-size asteroids between 330 and 3,300 feet (or 1,000 to 100 meters) -- 19,500 instead of 35,000 -- orbiting the Sun within 120 million miles (195 million kilometers) in Earth's orbital vicinity roughly (NASA news release; and Astronomy Picture of the Day). Larger and jumbo illustrations (video). Information and images about proposals to settle and exploit the Moon can be found at Sol Station. More images of Earth and the Moon are available at NASA's Planetary Photojournal. 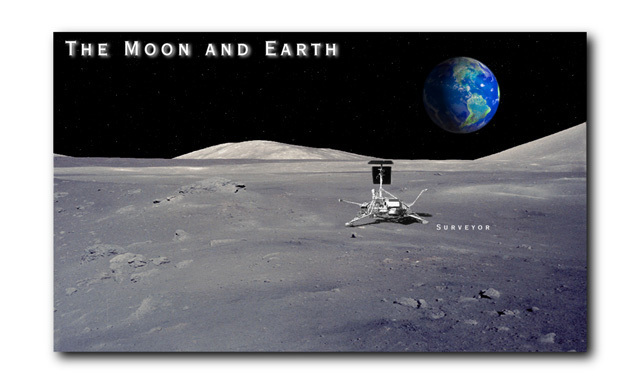 Fact sheets on the Earth and Moon are also available from NASA's National Space Science Data Center. For more information about the Solar System, go to William A. Arnett's website on "The Nine Planets", or to Calvin J. Hamilton's web page on "Earth".